:Sharon Betsworth examines the narratives, parables, and teachings of and about children in the gospels and the literature of Early Christianity. Betsworth begins with a discussion of the social-historical context of children and childhood in the first century before discussing the role of children in all four gospels. She shows that for Mark and Matthew, children are integral to understanding each evangelist's perspective on the reign of God and on Jesus' identity in each Gospel. In the Gospel of Luke the childhood of Jesus is shown to be crucial to the broader themes of the Gospel. In the Gospel of John, Betsworth examines the metaphorical use of the word 'children' looking at 'children of light' and of 'darkness'. She then explores stories of Jesus' childhood in the non-canonical Infancy Gospels of James and Thomas, as well as the childhood of his mother, Mary in the latter shedding light upon views of children, discipleship, and the person of Jesus in early christianity and in the ancient world more generally. 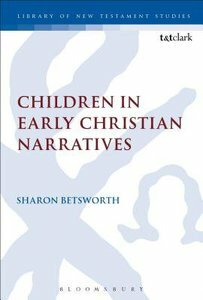 About "Children in Early Christian Narratives (Library Of New Testament Studies Series)"
Sharon Betsworth is Associate Professor of New Testament at Oklahoma City University, USA.